Ok, I'm finaly home after long working week. The fun war against SFP was real fun and great experiance.Punisher from BLOW told me that we played against ELITE SQUAD OF SFP( hm... we were lucky then). 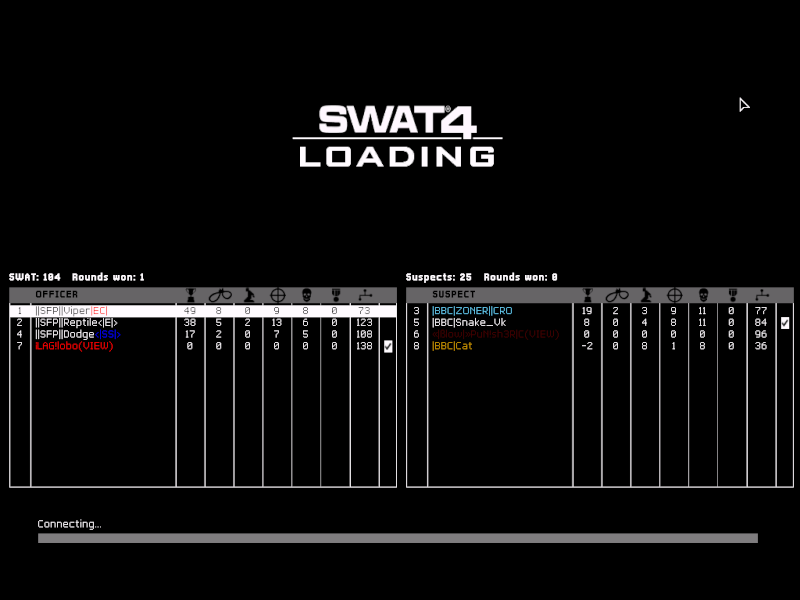 I think that this is my best score ever in swat4 (-2 ). 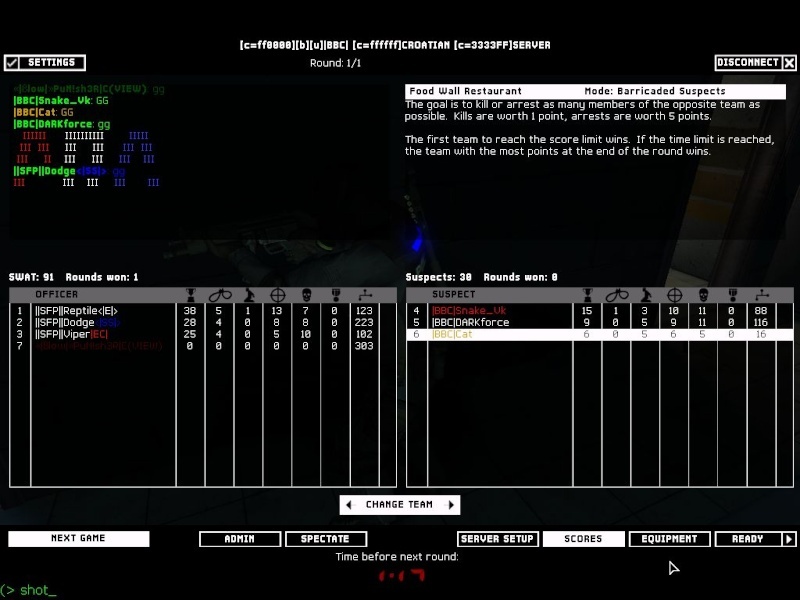 the real problem was cuz I was kicking the guys that just keep coming on server wanted to play. Next war I'm not playing on my server and I will have time to "kill" somebody. I finally make some points and the rest of my crew played good. To BBC crew: Hvala ekipo, bilo je ok,nije to ništa loše izgubiti od najboljih a i tek smo počeli. LOL NENO WTF IS THIS? Da, primjetio sam to i na SFP forumu. A di su to iskopali da mi je znat. to je bilo prije 4 mjeseca kad je BBC tek bio formiran i skupljala se ekipa za klan. Da,dečki su uigrani,imaju puno war-ova iza sebe. A treba postat i izgubljene war-ove. It was nice FW, we hade fun, not just becouse of winning, but in general Good guys dont finish last at the end!!!!! I hope we play some more wars, so u and we can develope to be better. For wars u learn the most from wars, its totally difirent gaming stille. 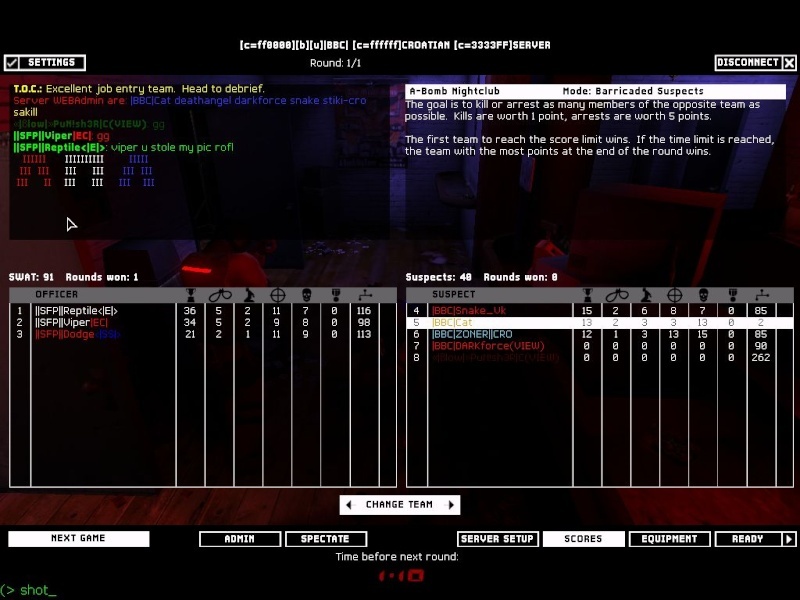 As i saw u beat COB, it seems u have great potential to do some more damage in swat4 1.0 maybe even to SFP. Cya in servers guys, have fun out there and in here.